Power Electronics and Motor Drive Systems is designed to aid electrical engineers, researchers, and students to analyze and address common problems in state-of-the-art power electronics technologies. 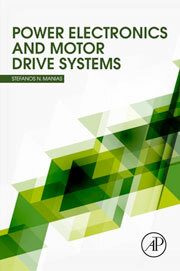 Author Stefanos Manias supplies a detailed discussion of the theory of power electronics circuits and electronic power conversion technology systems, with common problems and methods of analysis to critically evaluate results. These theories are reinforced by simulation examples using well-known and widely available software programs, including SPICE, PSIM, and MATLAB/SIMULINK. Manias expertly analyzes power electronic circuits with basic power semiconductor devices, as well as the new power electronic converters. He also clearly and comprehensively provides an analysis of modulation and output voltage, current control techniques, passive and active filtering, and the characteristics and gating circuits of different power semiconductor switches, such as BJTs, IGBTs, MOSFETs, IGCTs, MCTs and GTOs.